Industry 4.0 is not a greenfield development. 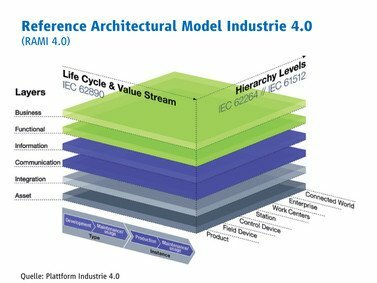 Rather, existing systems must be further developed along the path shown by the reference architecture model Industry 4.0 (RAMI). The Industry 4.0 platform has set a regulatory framework with RAMI, in which the concepts of Industry 4.0 are further developed. Product development, production and application right up to maintenance and disposal will be fully integrated in the future. The left axis of the RAMI cube expresses this as a life cycle integration. The processes within the entire value-added chain will also be more integrated than before (Value Stream). In RAMI, a whole series of standards is to be used. These standards should find their use both to define the internal structure and to communicate the components. Finally, all components, in an Industry 4.0 world, should communicate with each other via a so-called administration shell based on these standards.